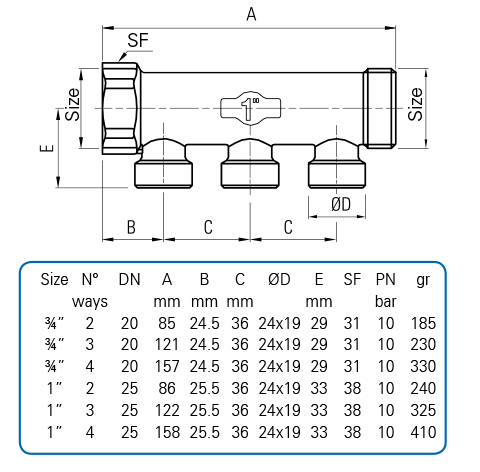 A range of WRAS approved nickel plated, stamped brass manifold in ¾” and 1” inlet sizes. Available in 2, 3 and 4 way options, which can be screwed together to create extended manifolds. Modular sanitary manifolds are a cost effective way to install point to point plumbing in order to reduce concealed intermediate joints. 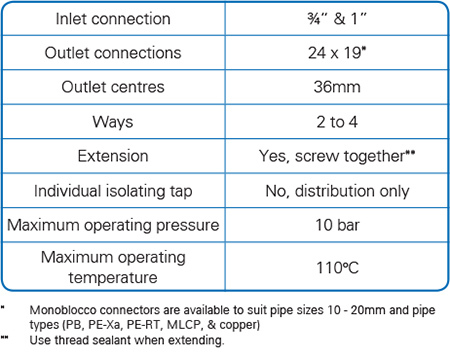 It can be easily connected to any of the wide range of WRAS approved plastic pipes available, by using Emmeti Monoblocco single-piece connectors. It can also be used with conventional copper pipe if required. Modular manifolds can be mounted using our slider rail system, or placed within a ‘Termobox’ plastic manifold cabinet.